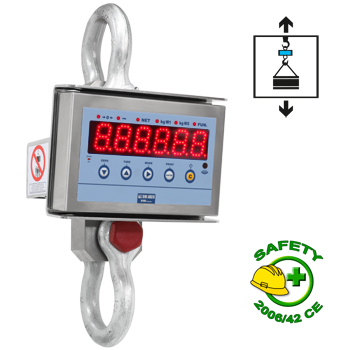 Radio frequency weight transmission to remote indicator, up to 70m indoors. Remote weight indicator connected in radio frequency, with the printer or other accessories. Sturdy and reliable, usable indoors as well as outdoors. Minimum reduction of the crane’s lifting space. 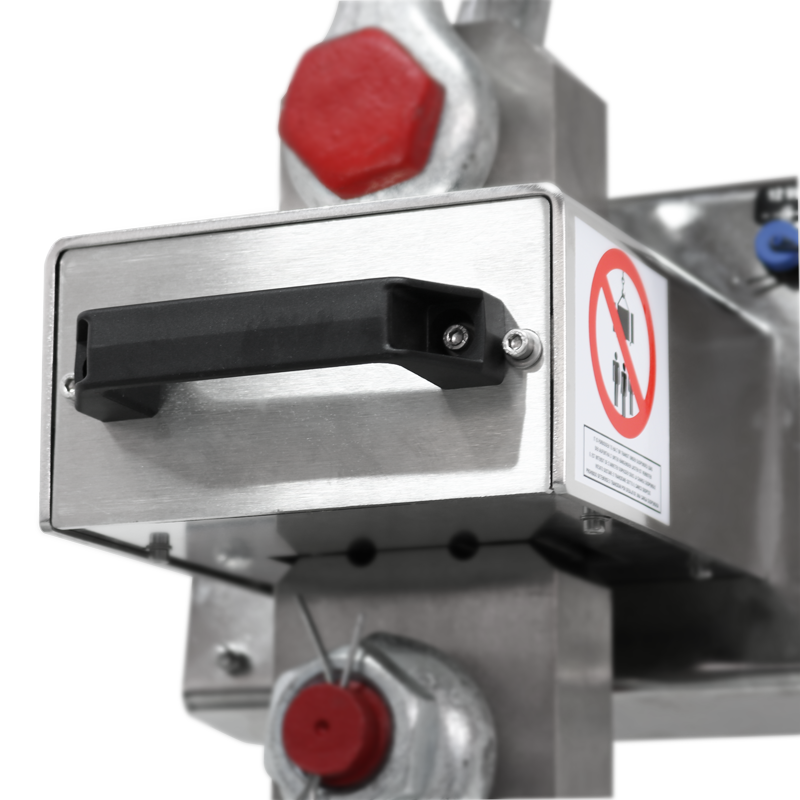 The models with up to 15000 kg capacity are fitted with test certificate obtained with sample weights, for higer capacities the certificate is available on request. Extremely bright large red DOT LED 40mm display, which guarantees a perfect visibility of the weight from any angle, also from a long distance with direct sunlight. Usable indoors as well as outdoors, great visibility also in full sunlight. 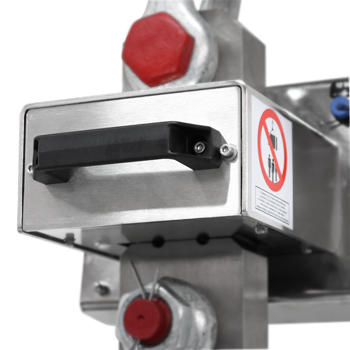 Sturdy STAINLESS steel structure, with IP67 protection degree of the load cell and the electronics, against dust and sprays. Extremely reduced distance between upper and lower shackles. 5-key waterproof keypad: ZERO, AUTOMATIC TARE, MODE, PRINT, and ON/OFF. Programmable digital filter, for an excellent weight display in any working condition. Programmable automatic switch-off function, either through keypad or remote control. Fitted with radiofrequency 6-key remote control, configurable as simple automatic tare or as a remote keypad. Configured for an 868MHz radio interface or WiFi, for connection to PC or to a remote terminal and printer. Rechargeable battery, with an average life of about 30 hours. Configured for a second optional extractable battery for 24/7 continuous use. Fitted with 230Vac 50 Hz battery charger. 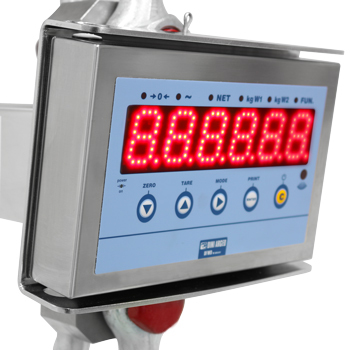 Programmable digital calibration and Set-Up directly from the keypad or from PC through Dinitools. 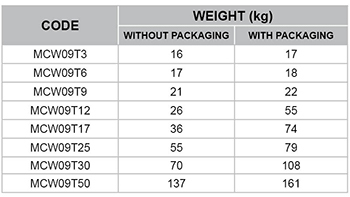 Operating temperature range: -10/+40 ºC. for the complete protection against scratches and bumps during transportation. 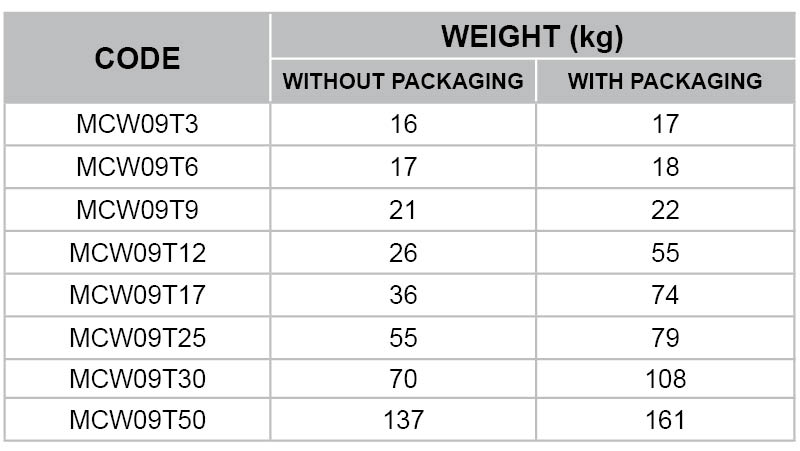 The crane scale is shipped inside a sturdy wooden case which is custom made (MCW09T12-1, MCW09T17-1, MCW09T25-1, MCW09T30-1, MCW09T50-1 versions). 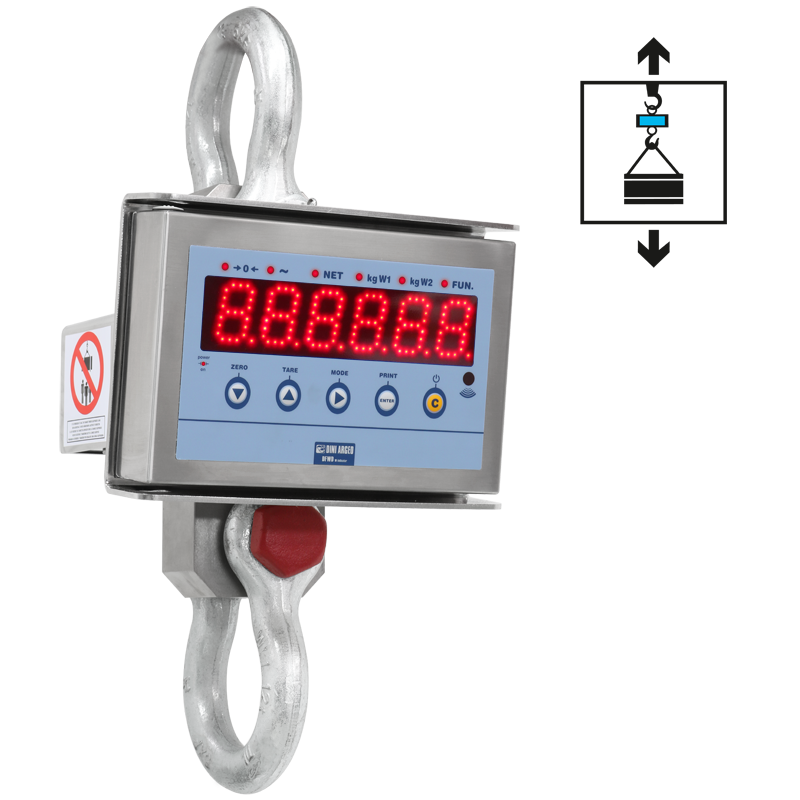 The crane scale is fitted with a radiofrequency remote control which allows to do the Zeroing; the tare; enable / disable functions; printing; switching-off the crane scale. MCWKBK50 Kit for continuous use 24/7 for MCW09T50 made up of extractable battery and device for the recharge with status indication, to be used with the supplied charger. 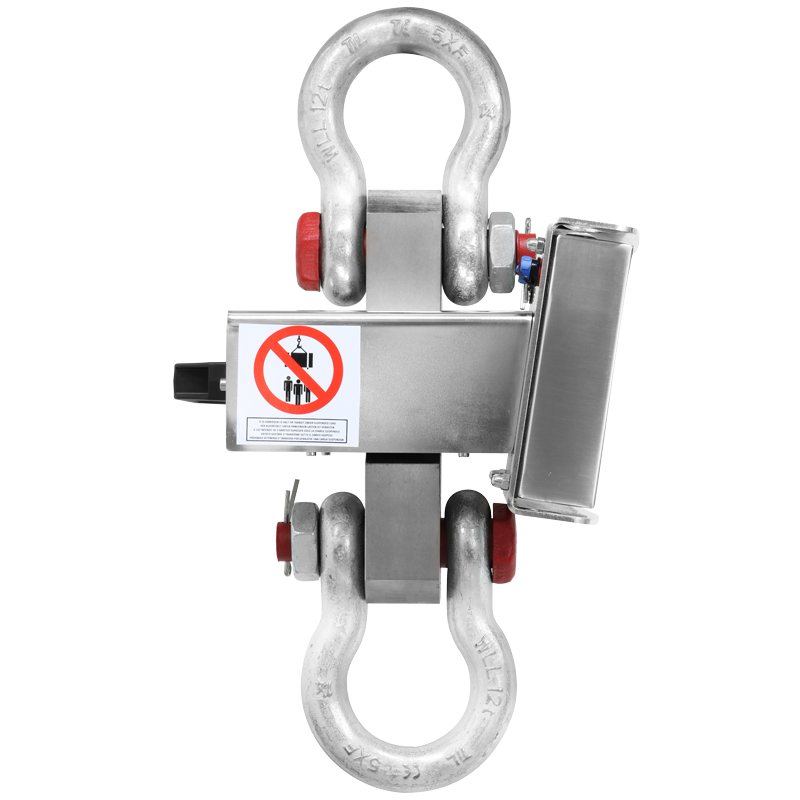 GG4 Swivelling bottom hook with safety lock 4 t.
GG7 Swivelling bottom hook with safety lock 7 t.
CA8 Connection ring 8 t.
CT11 ISO 17025 calibration certificate from 35001 to 50000 kg. For crane scales.